The comma, according to Lynn Truss, clarifies the grammatical structure of a sentence and points to literary qualities such as rhythm, pitch, direction, tone and pace. Truss says that careful use of the comma announces ‘an ear for sense and rhythm, confidence in your style and proper respect for your reader’ (p.70). The title refers to a well-known joke, which plays on the ambiguity of ‘shoots’ and ‘leaves’ as homonyms. To the ear and eye these words appear the same, but in different contexts their meaning changes. So, in the joke, ‘A panda walks into a bar…’, contexts collide, meanings are superimposed, but the punctuation rescues the reader. This shows us exactly why reading for meaning is a multi-layered affair. 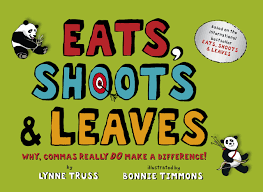 To read the phrase ‘eats, shoots and leaves’ with understanding involves observing the comma as a formal separation of the first two verbs in a series of three, as well as inhibiting a miscommunication of meaning. From a rhythm-based perspective, the comma prevents ‘eats shoots’ from being read as a verb-noun pair. Verb-noun pairs are rapidly processed, high-frequency phrases that provide immediate understanding, such as ‘drives cars’, ‘writes books’, ‘plays games’ and ‘buys drinks’. Remarking on the similarity between punctuation and musical notation, Truss observed that ‘punctuation herds words together, keeps others apart’ (p.20). Although there are different patterns of emphasis (prominence or stress) in different languages, dialects and indeed regional variations of any given language, what is important is that rhythmical cycles operate at several levels in both language and music. Remarkably, we generate these highly organised, intricate and geometric relationships of time and meaning automatically at a subconscious level of awareness. At a conscious level, we are more likely to realise how involved or engaged we feel with the meaning of the story or song. Once our attention has been captured, we as an audience can become phase-locked into an experience of heightened awareness, which is effortlessly stored by the memory. In fact, laws, myths, legends and cultural histories have been preserved across generations in this way. This form of group learning via listening feels somewhat mysterious and therefore has often been vaguely described in phrases such as, ‘you could have heard a pin drop,’ ‘having the audience in the palm of your hand’ or ‘sitting on the edge of your seat’. The phase-locked experience is not unique to humans as most living things synchronise with cycles of light intensity. There are also patterns of synchronised sound among insects and synchronised movement in flocks of birds, shoals of fish and herds of cattle. Through language and music our collective response to sounds (in the air or on the page) naturally predisposes us to become attuned to the recurring cycles of phrases, patterns within phrases and the overarching structures within which phrases are meaningfully grouped. I am not suggesting that we humans are mindless creatures, intrinsically satisfied by the hypnotic pull of recurring rhythmical patterns. No, we are very complex and capable of a vast range of behaviour from incredible subtlety in our rhythmic awareness to tremendous violations of natural rhythmical cycles. In general, our desire for novelty and our urge to create, to surprise, to shock, to satirise and push against outdated institutions, is expressed through rhythm. We have archived our experiences through storytelling and music with the resonance of an authentic human voice. The elasticity of congruent rhythmic structures accommodates newly-combined patterns, reminding us that far from being hypnotised by our own sounds, we are dynamic communicators with the ability to express, create, share and reflect upon our experiences. Do you have any feedback on this blog post? Email or tweet us.